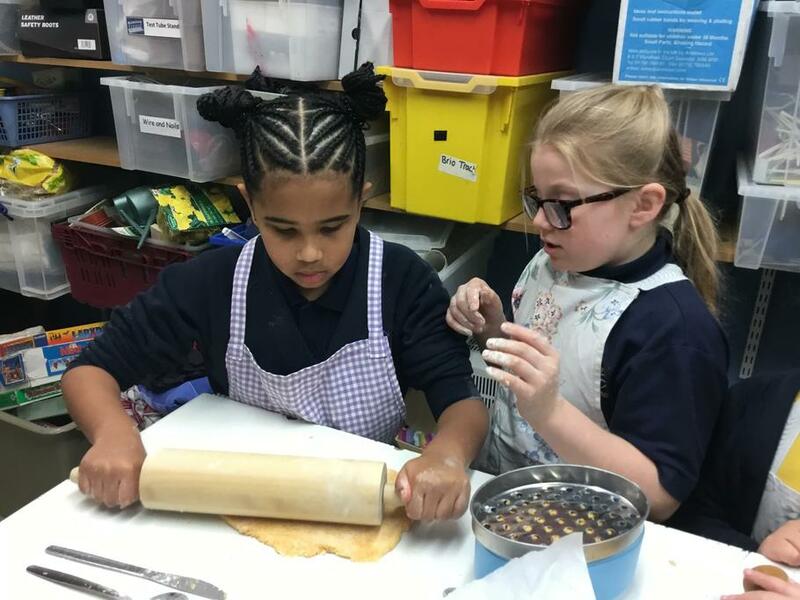 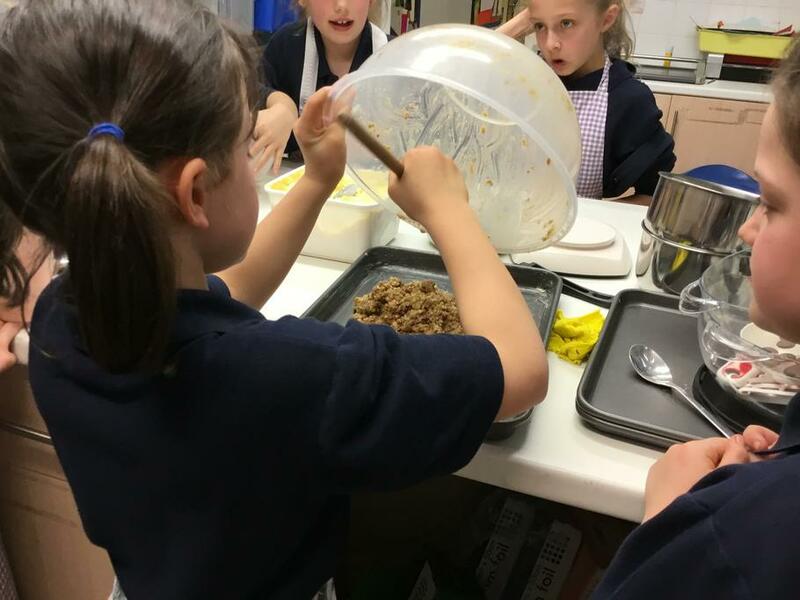 Our last cookery session with the group of years 3 and 4s, we made chocolate crispy buns to sell to the whole school at playtime. 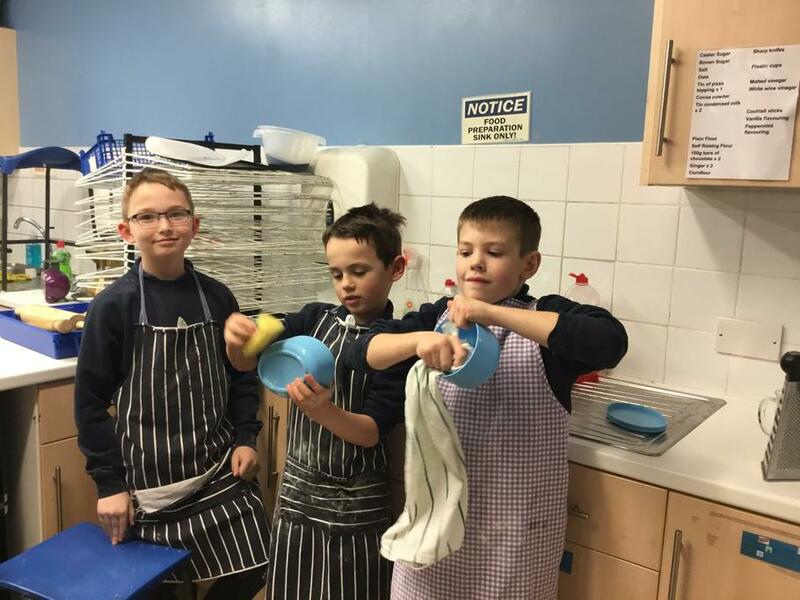 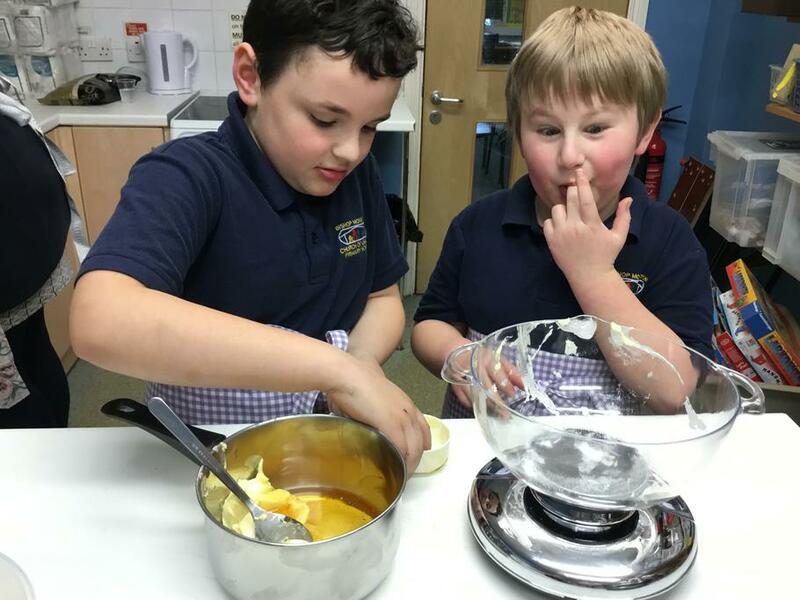 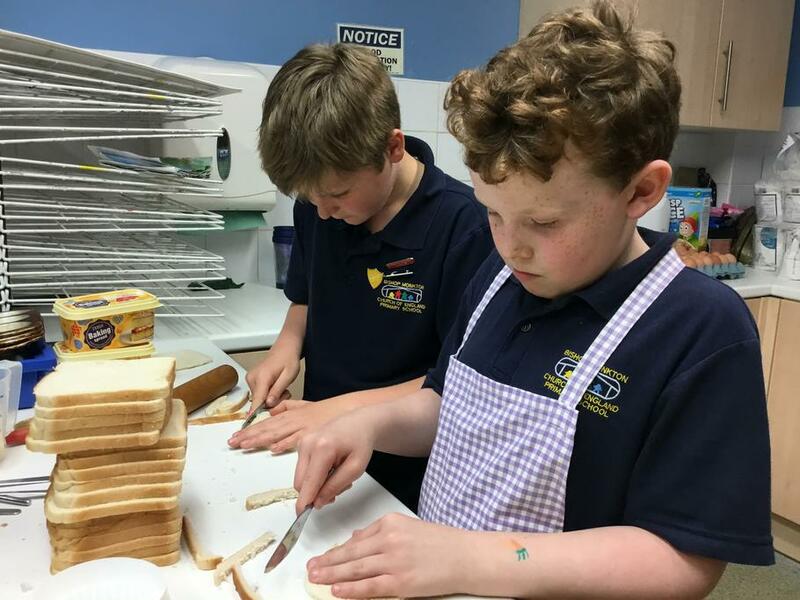 They went down a real treat and in the process raised £34.00 towards cookery club to buy ingredients and new equipment. 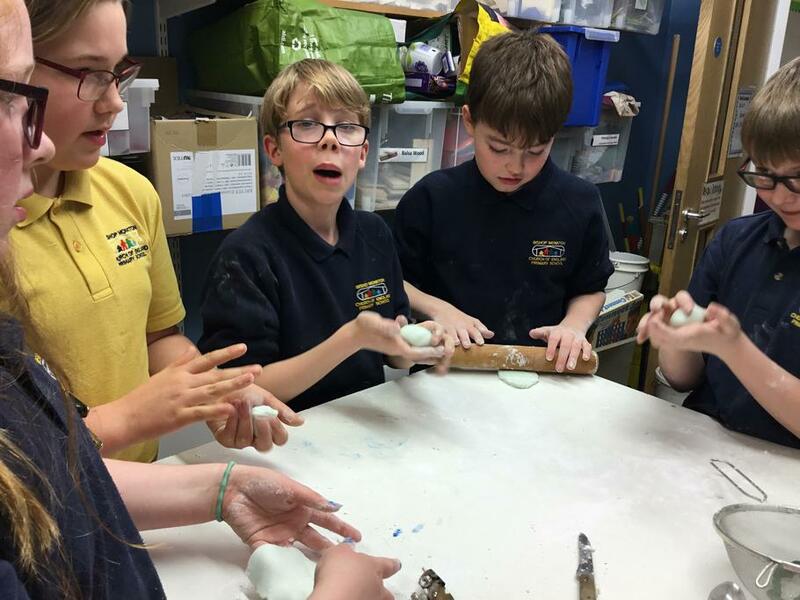 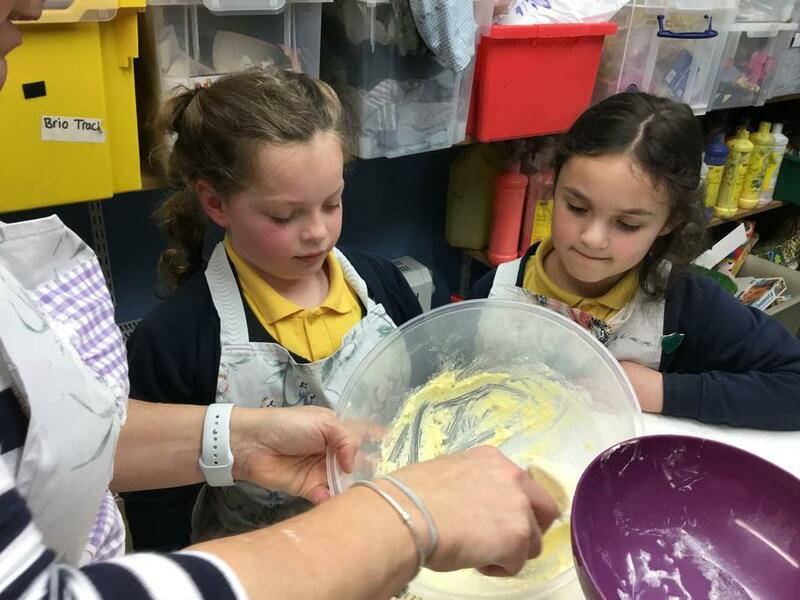 Mrs Verrill and Mrs Coupland are having a couple of weeks break before re-starting after Easter with some year 2s. 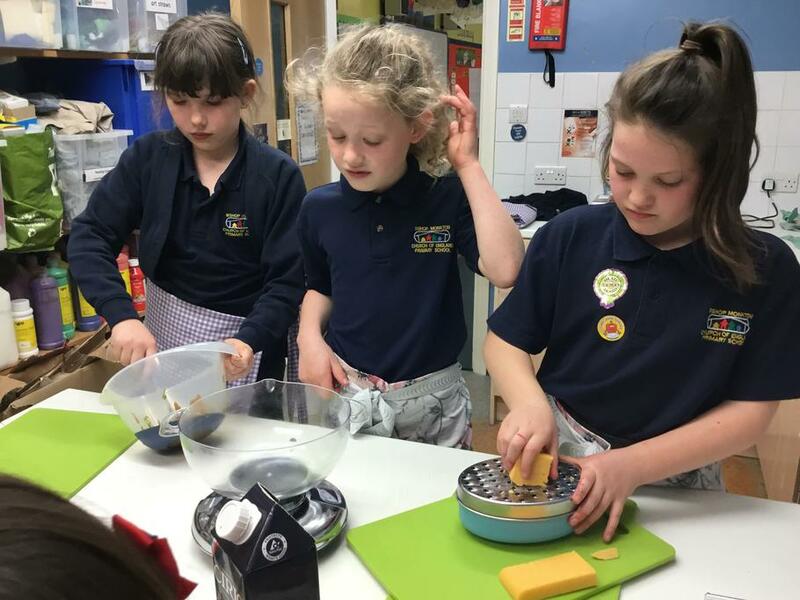 19/3/19 chocolate brownies yum yum. 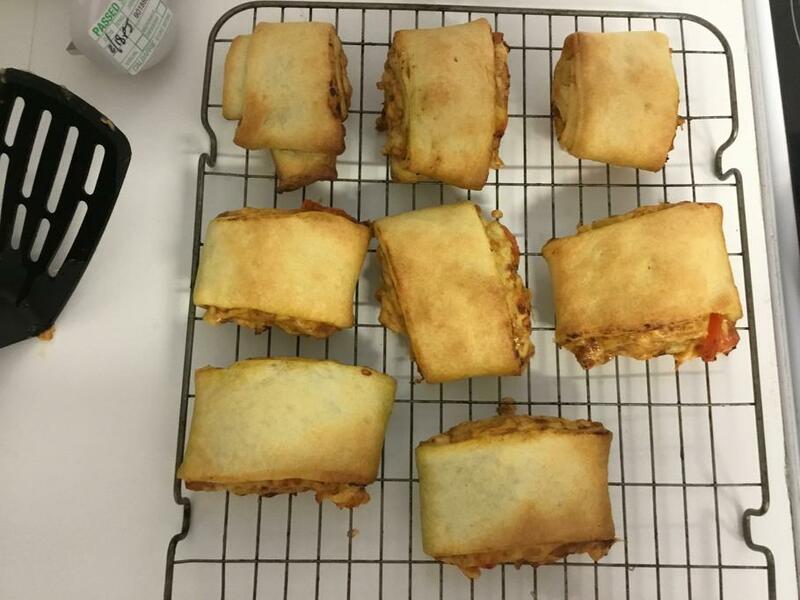 12/3/19 - always a favourite Baguette pizzas. 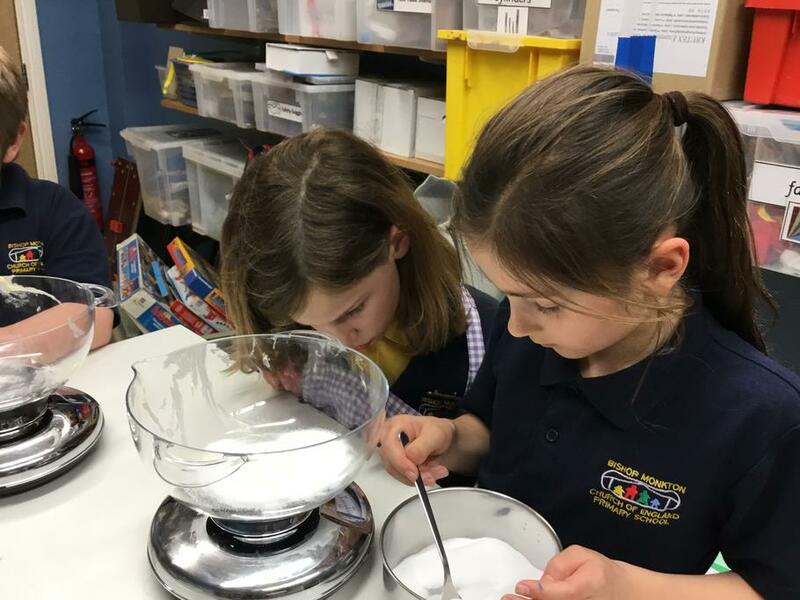 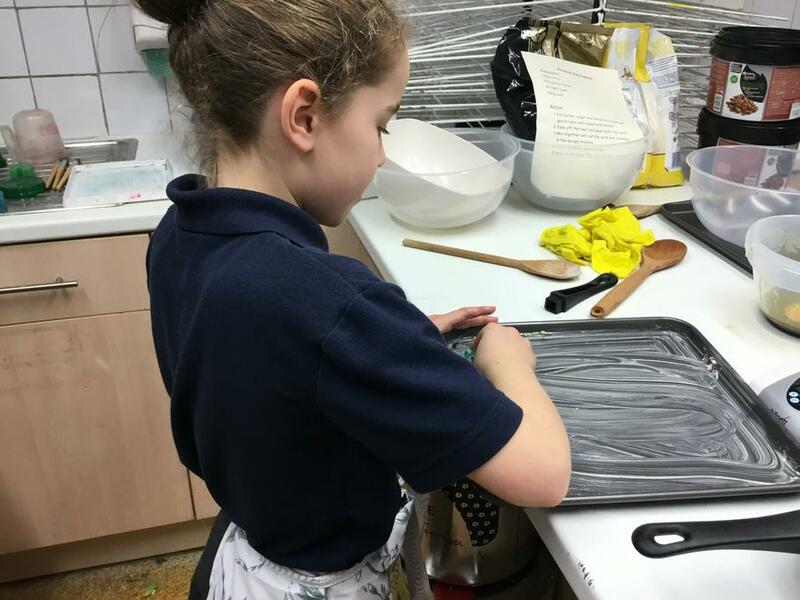 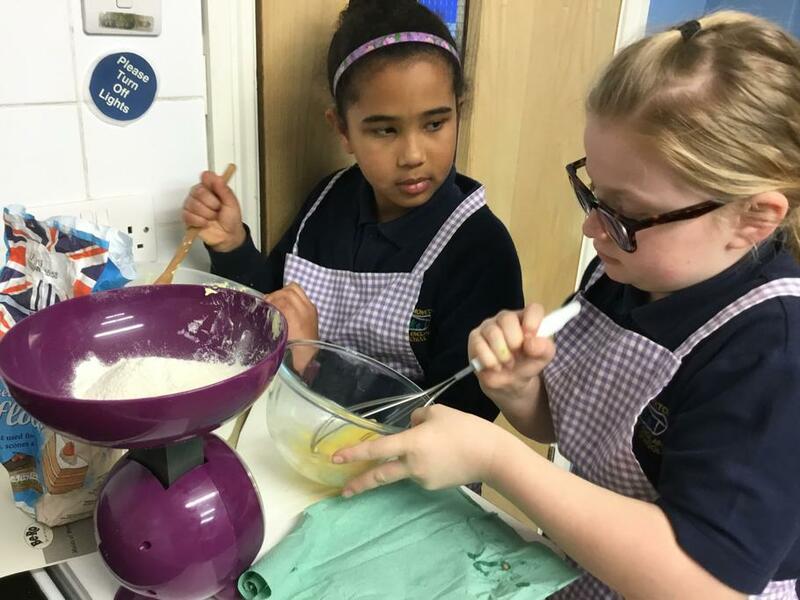 5/3/19 Baking Maids of Honour - using cake mixture and pastry. 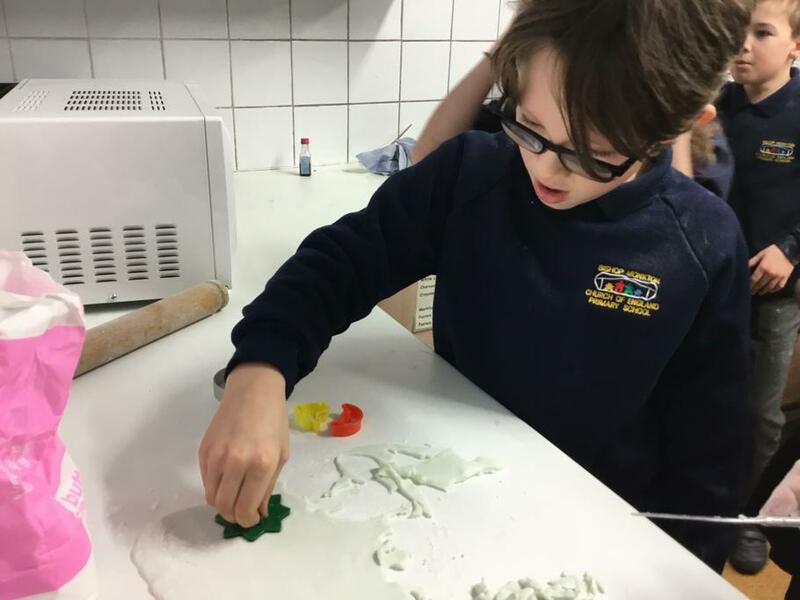 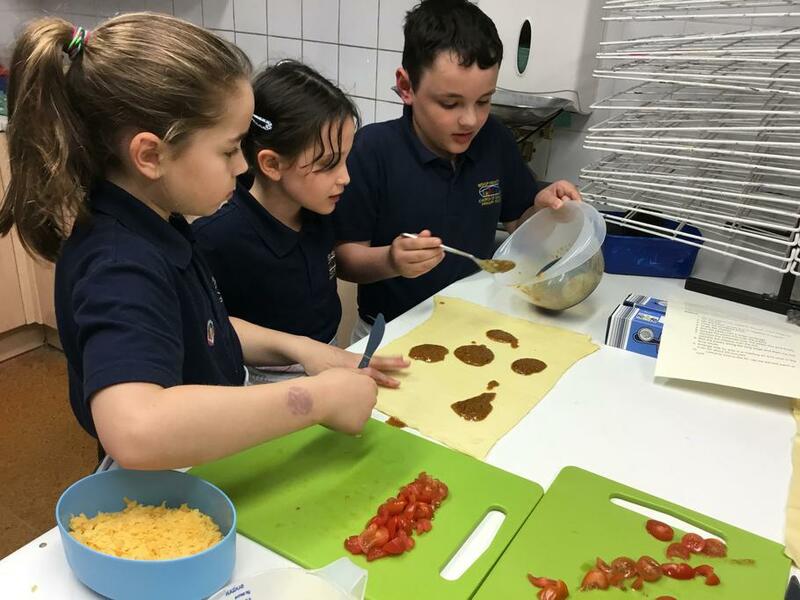 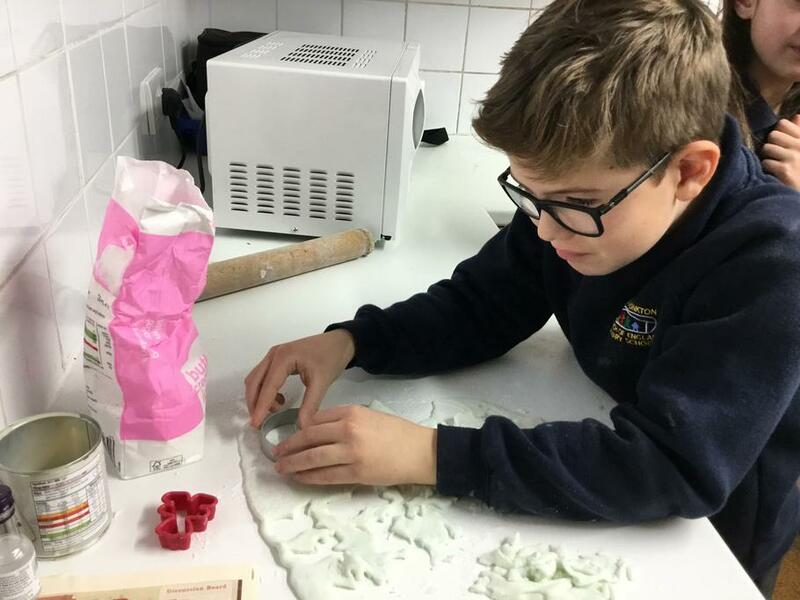 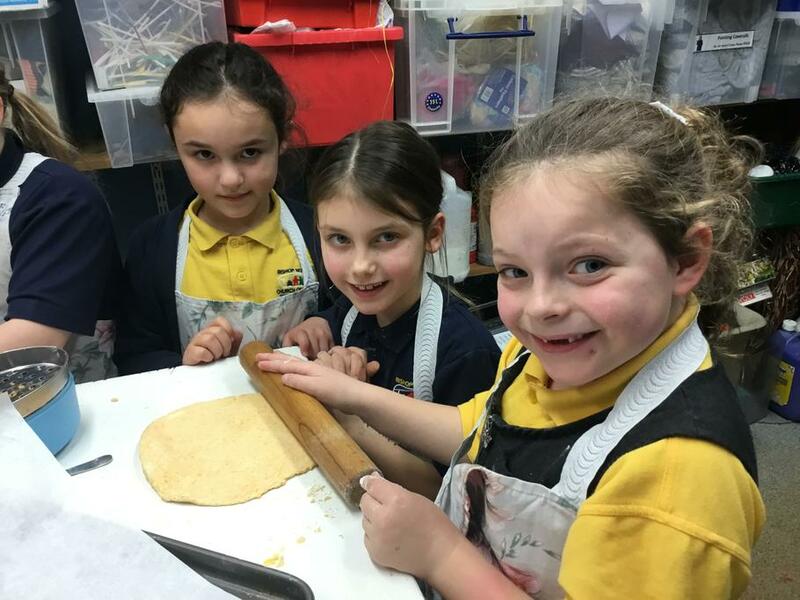 Vegetable wraps 5/2/19 - carefully cutting the vegetables was the skill we learnt this week as well as cooking using the hob. 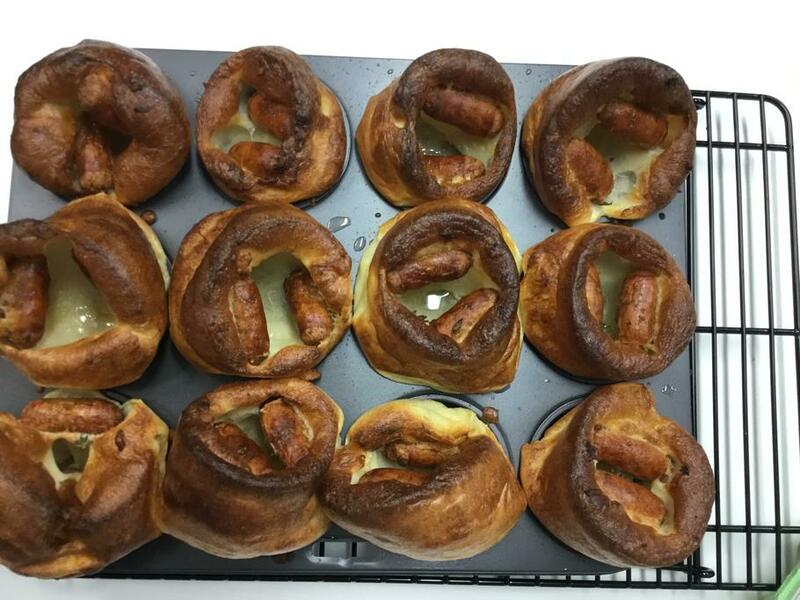 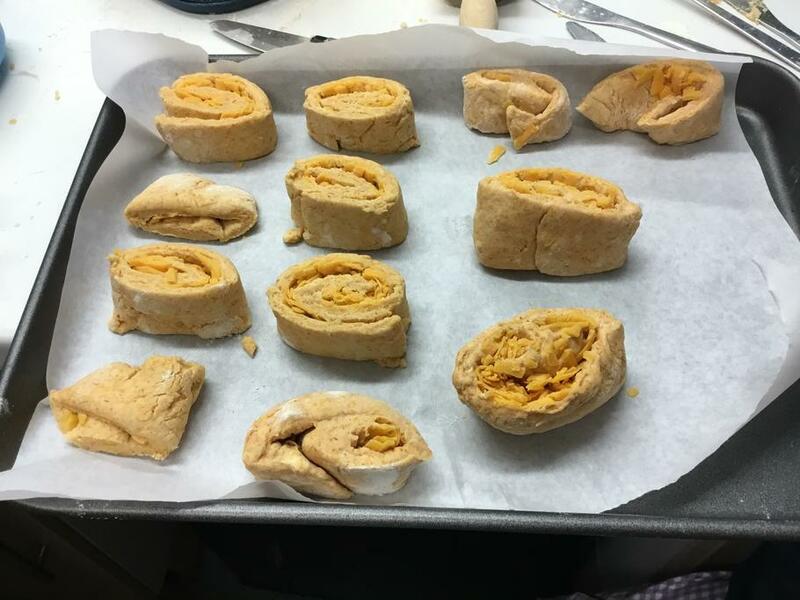 This week we used the rubbing in method to make the cheesy roll ups. 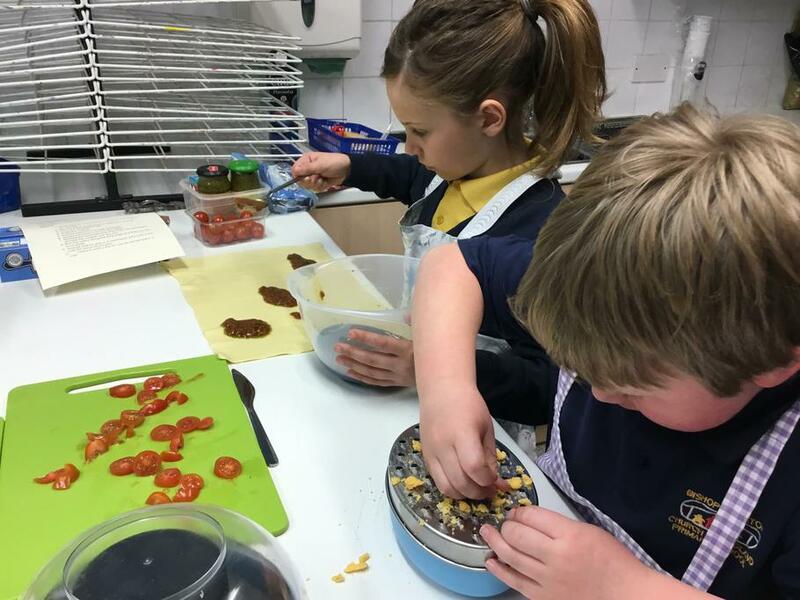 The children worked in 2’s and 3’s and had to weigh out all the ingredients as well as follow the method on how to make the roll ups. 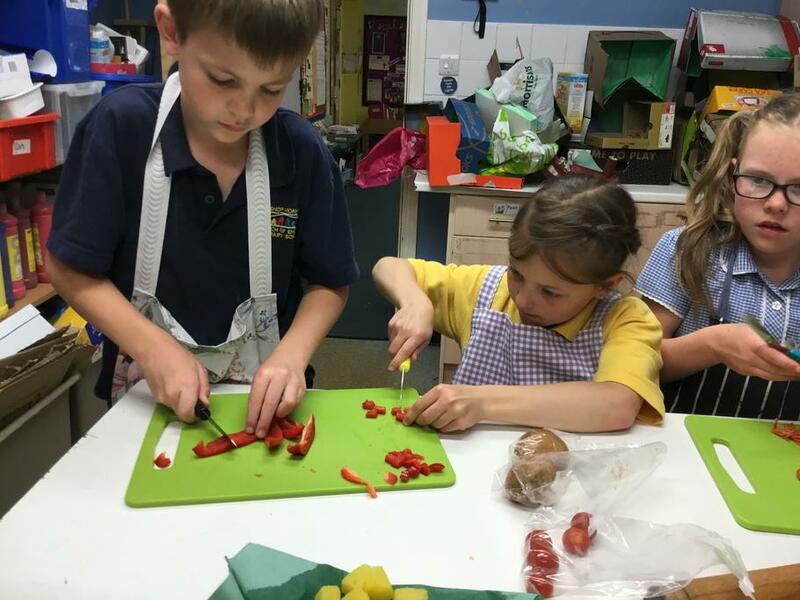 The children all tried paprika! 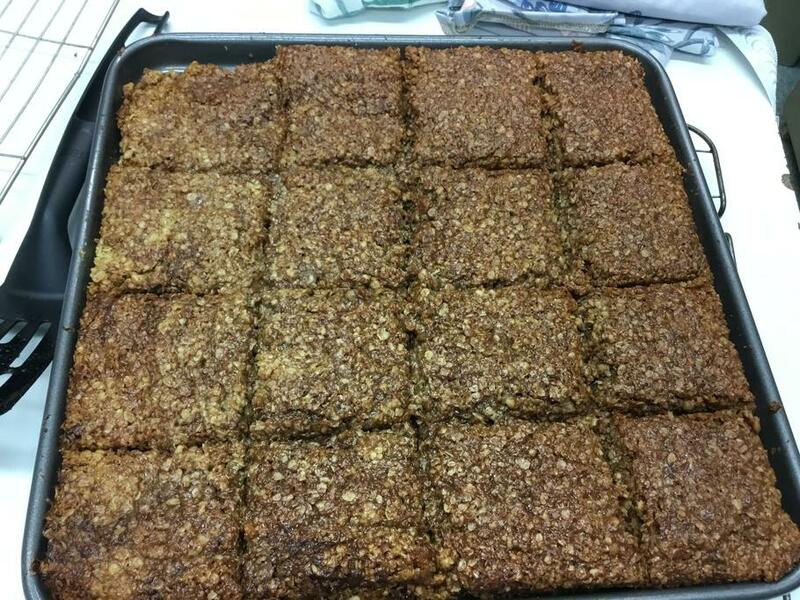 and liked it. 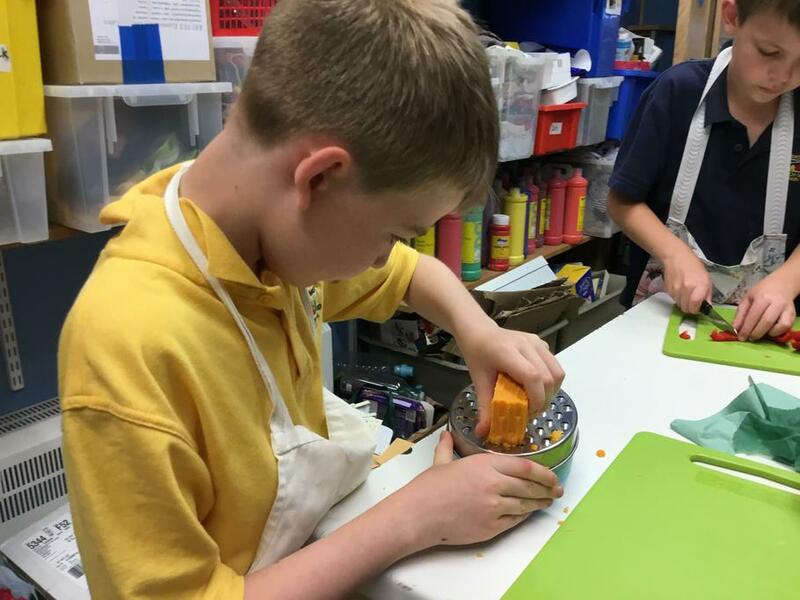 We had to be careful using the grater when grating the cheese. 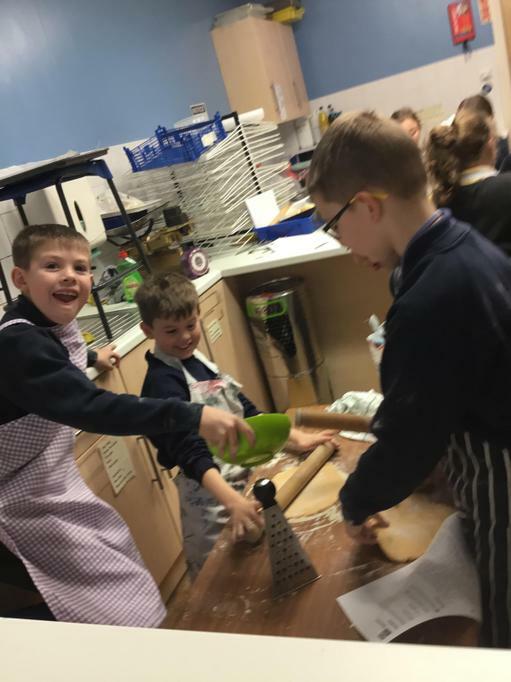 The children all proved experts at using the rolling pin and listened to the advice of not pressing the rolling pin down to hard. 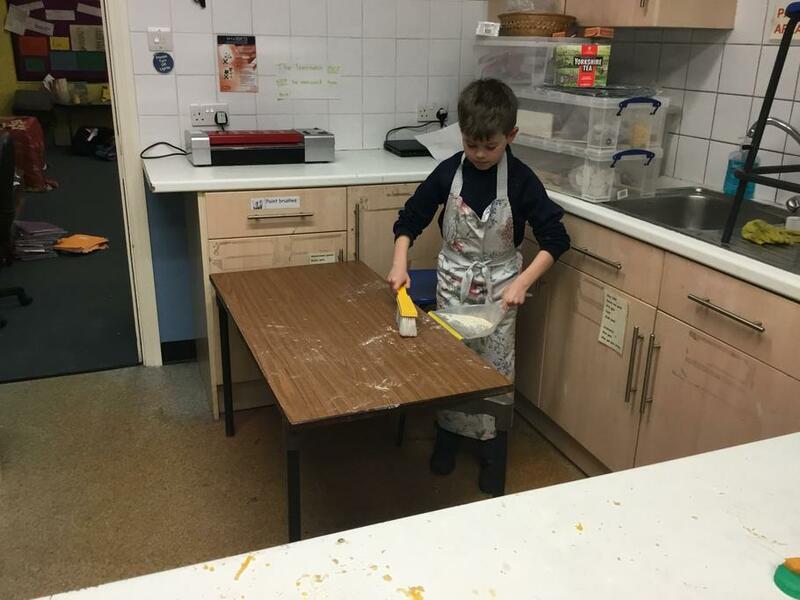 Afterwards, the children washed up and tidied the DT room, leaving it spotless. 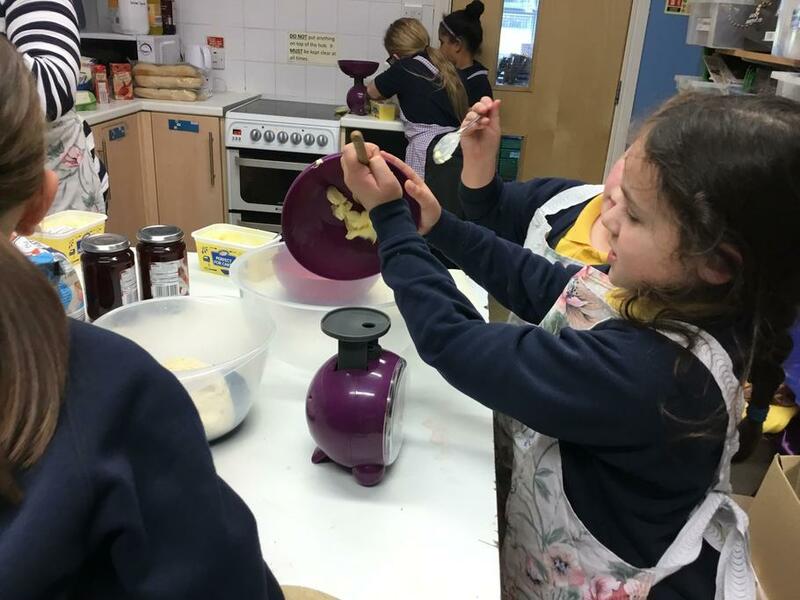 Our first week with the Year 3/4 group. 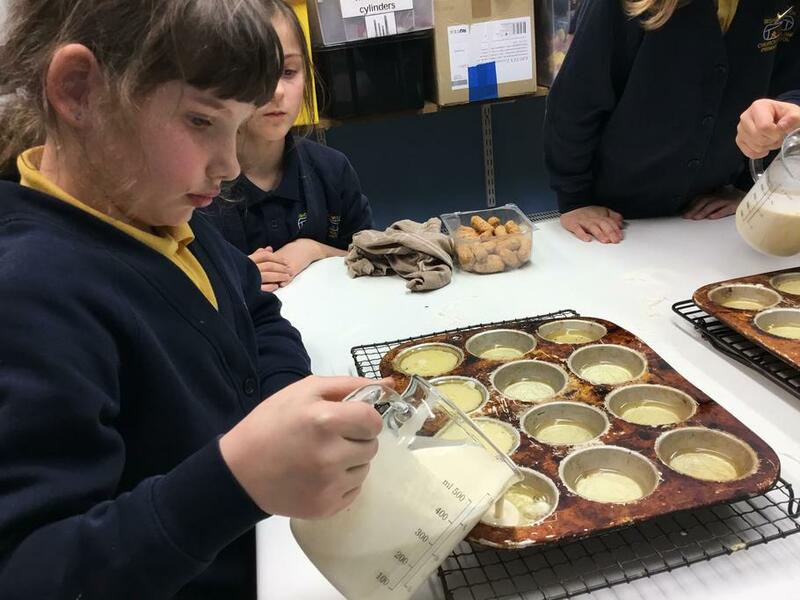 We made Apple Muffins, using the creaming method. 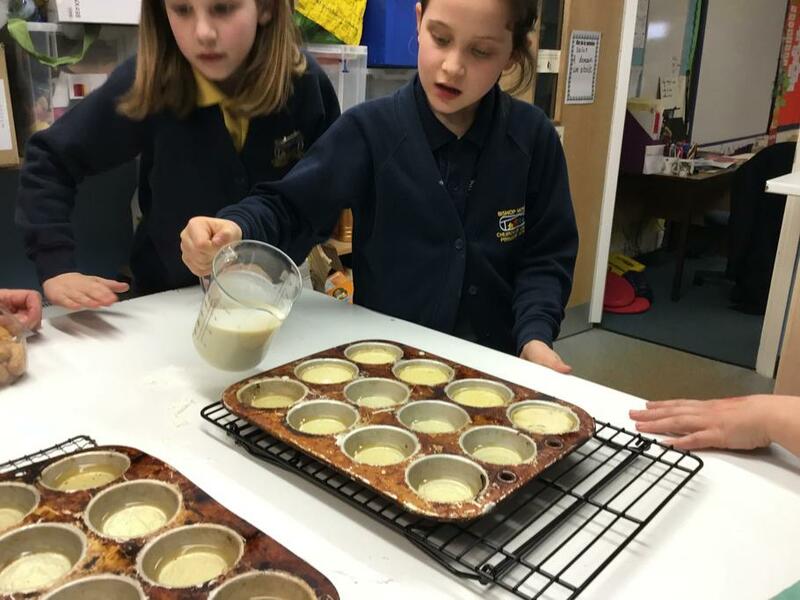 The children were very keen to make the muffins and followed the recipe well. 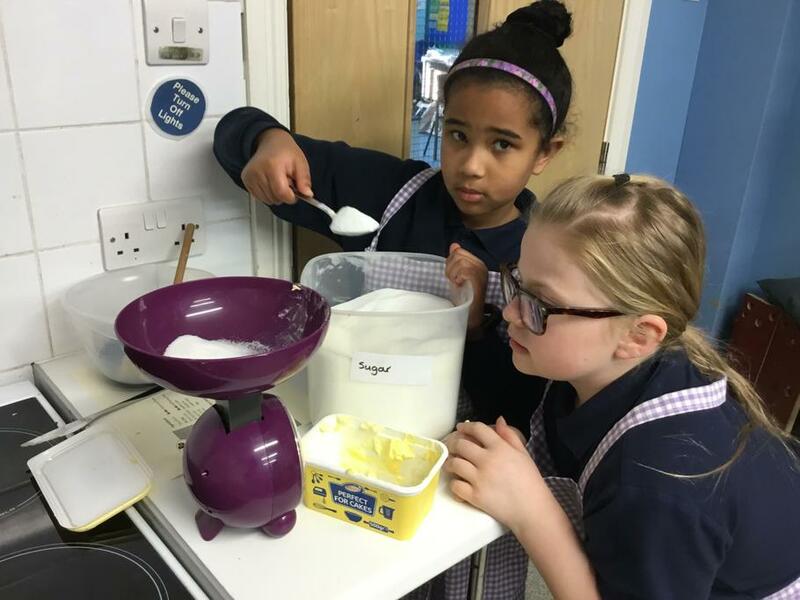 They were a little anxious when it came to cracking the eggs into the mixture. 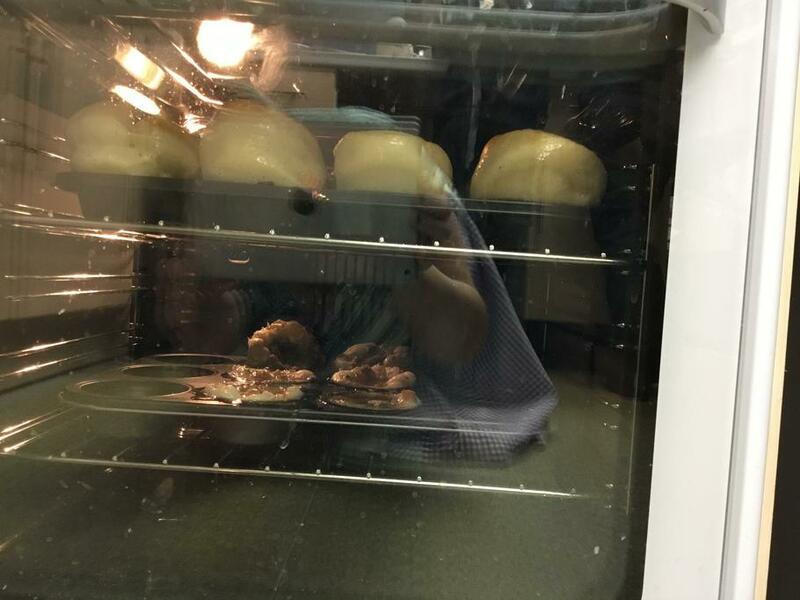 We saved a couple of the muffins for Mrs Brown and Mrs Graham, and they both said they were ‘delicious’ a very high accelade indeed. 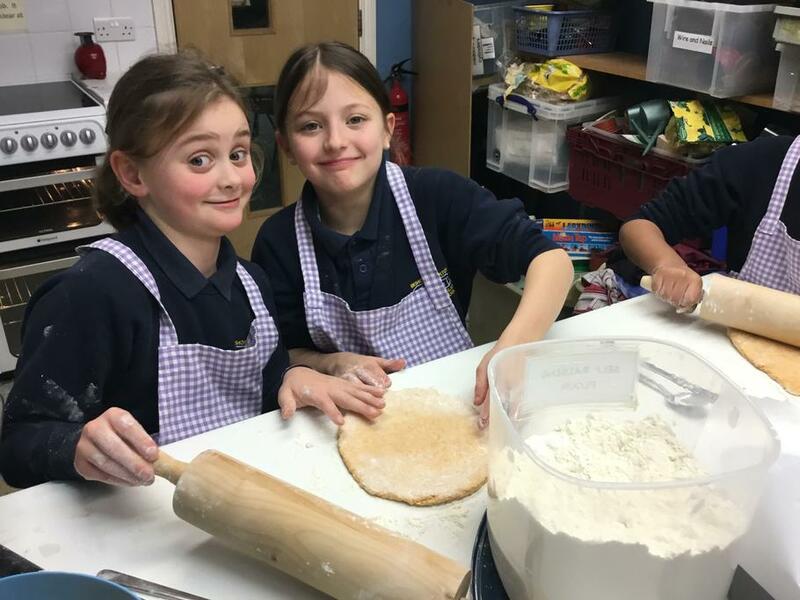 Our first attempt at making SODA BREAD...it was very, very nice. 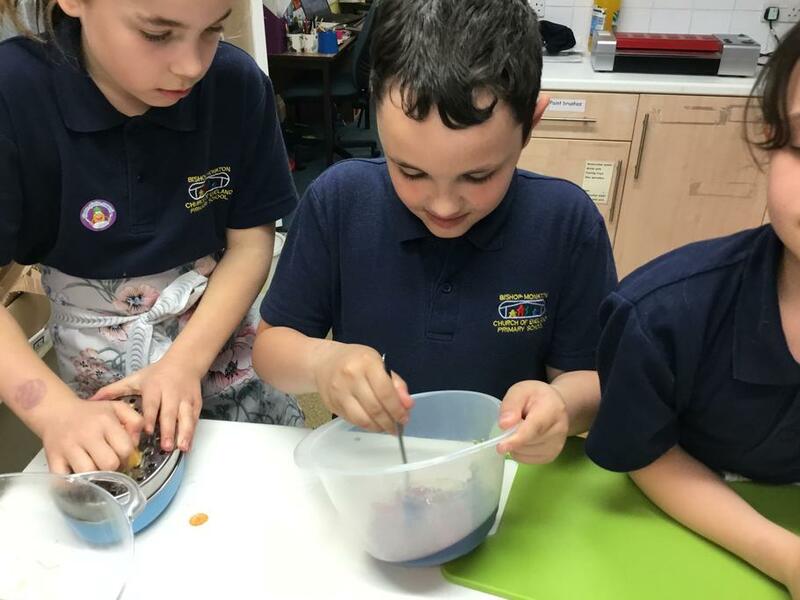 Chocolate apples for Bonfire Night...I think they enjoyed sampling the decorations. 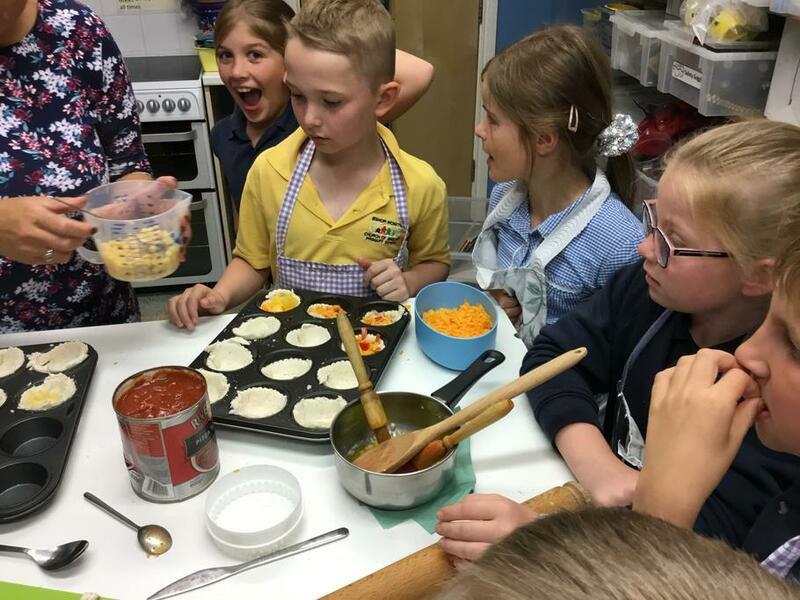 French bread pizzas...very, very tasty. 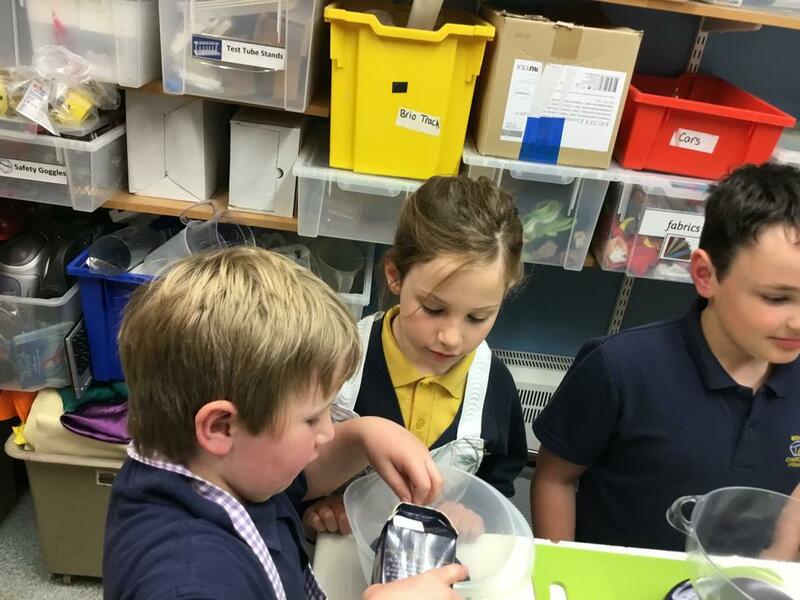 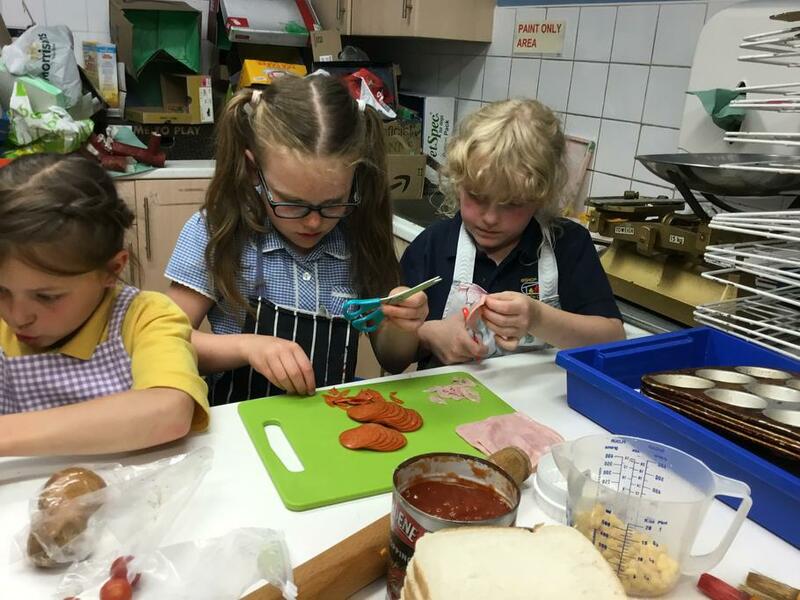 Cookery club with the help of Lydia, Grace, Adam and Edward. 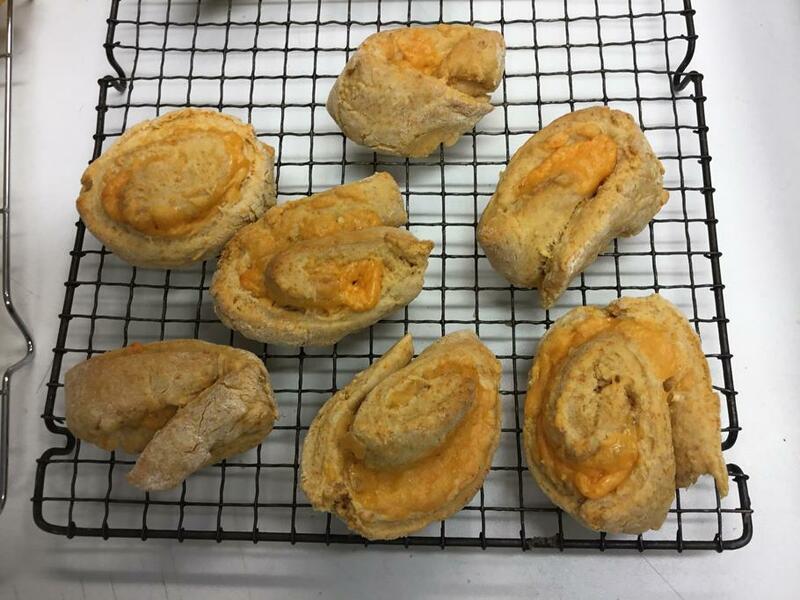 Making delicious cheese scones. 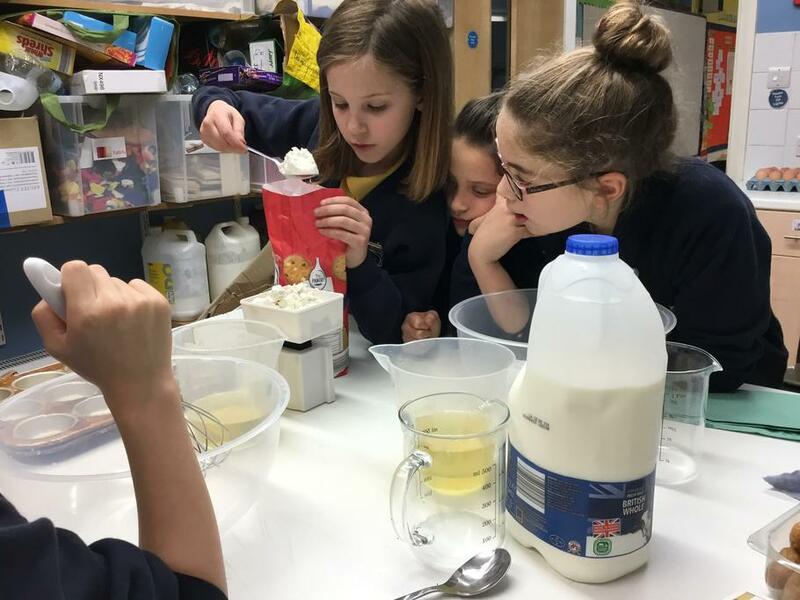 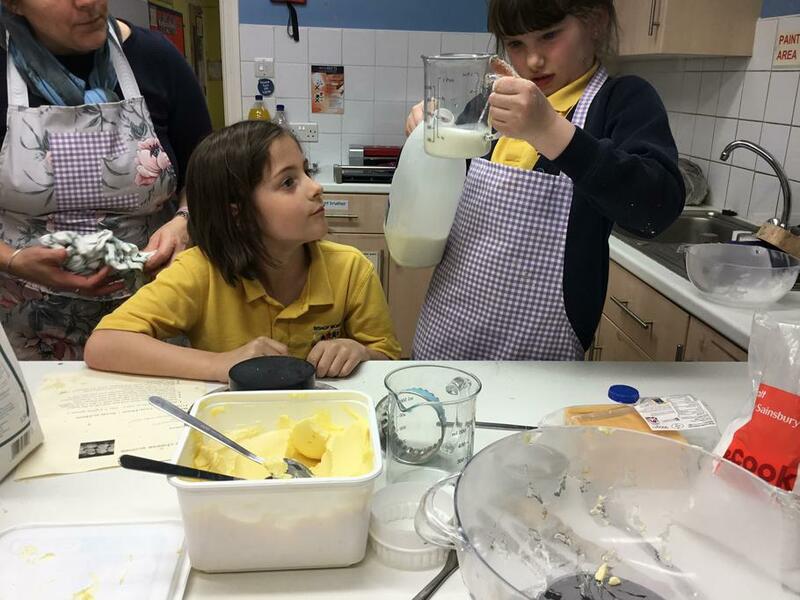 Our last session with the year 4 cookery clubbers. 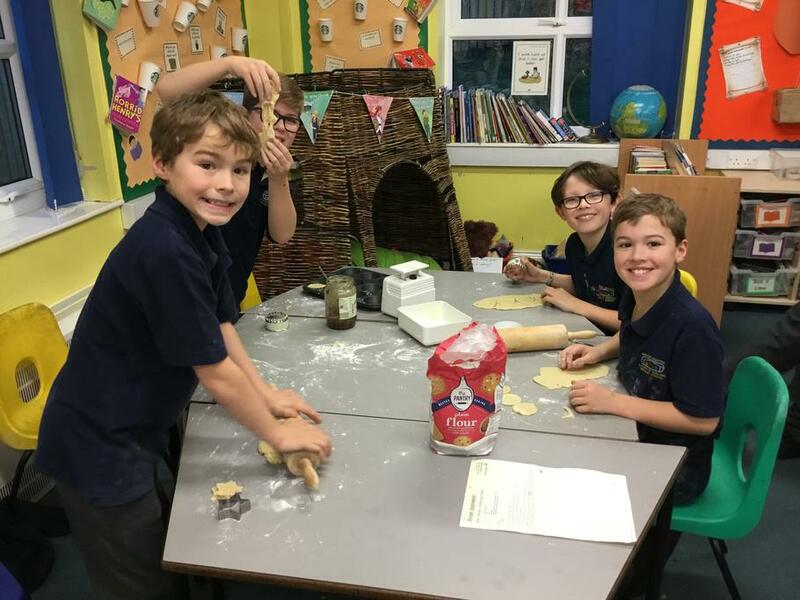 What a great bunch. 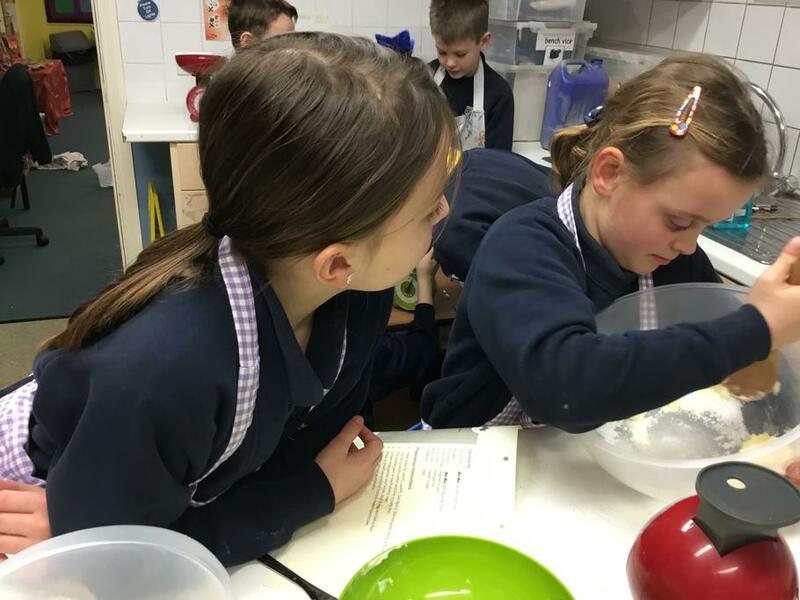 Mrs Verrill and I are looking forward to hearing about their baking at home. 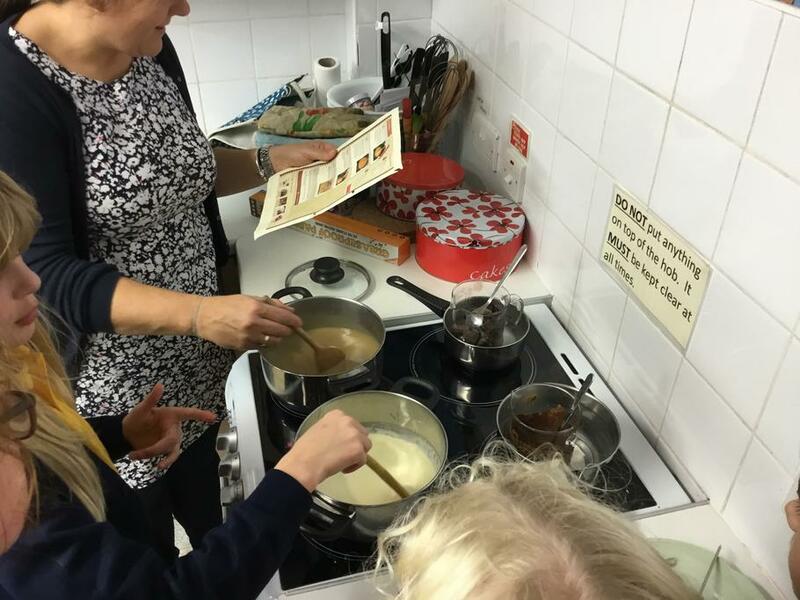 For the last week we made chocolate brownies and completed our recipe booklets. 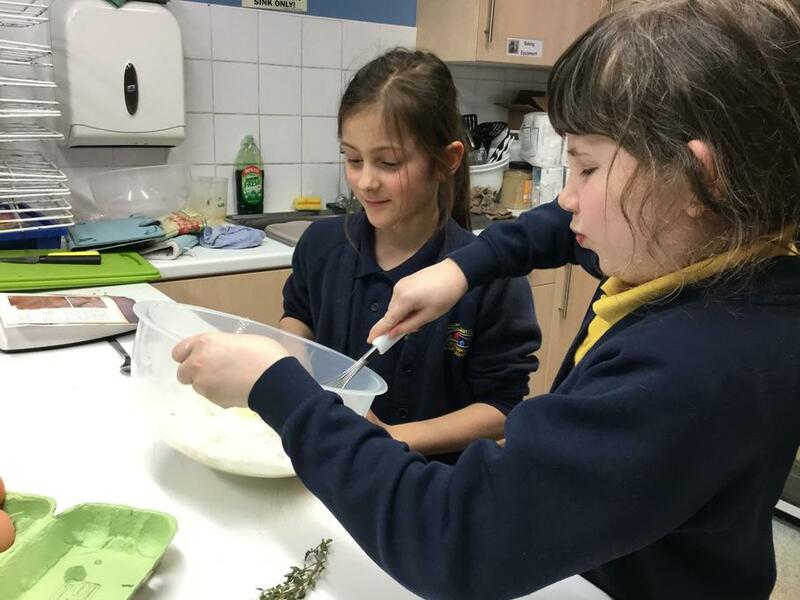 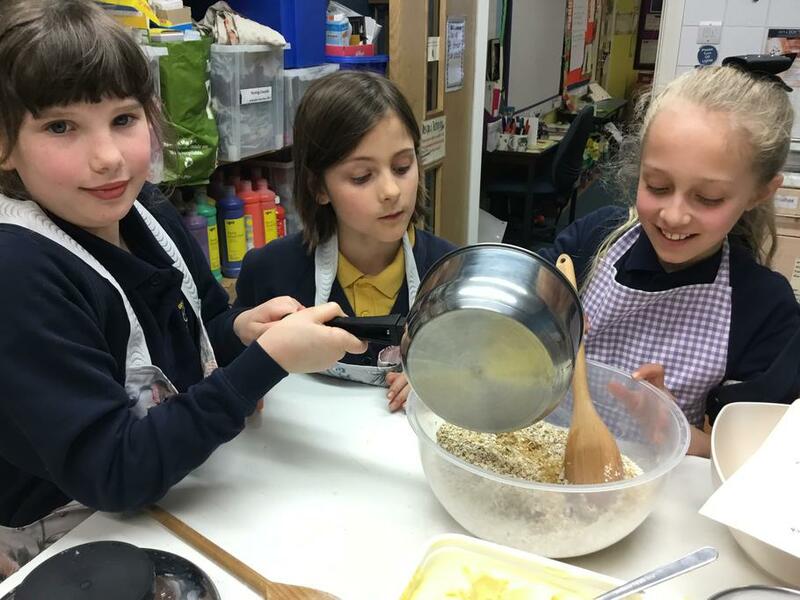 Y4 Cookery Club with their recipe booklets. 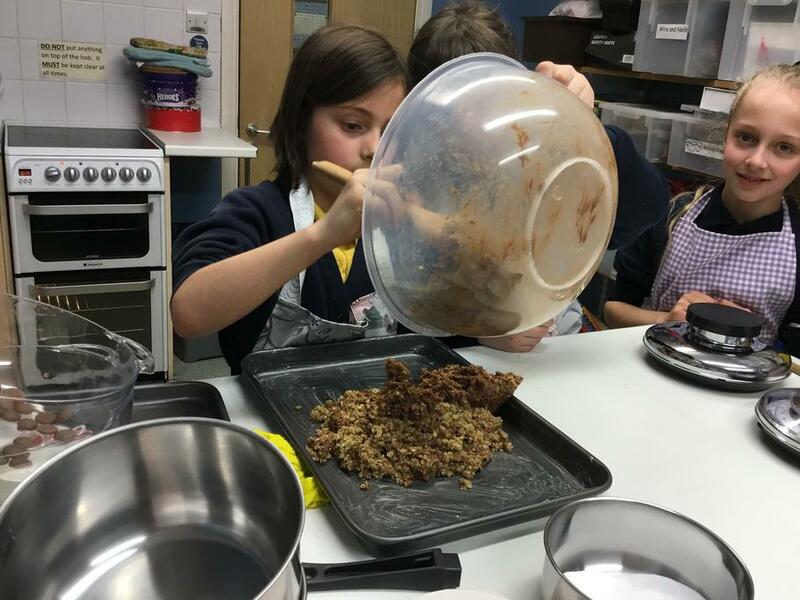 Making chocolate flapjack, Mrs Verrill and I thought the children enjoyed tasting all the ingredients! 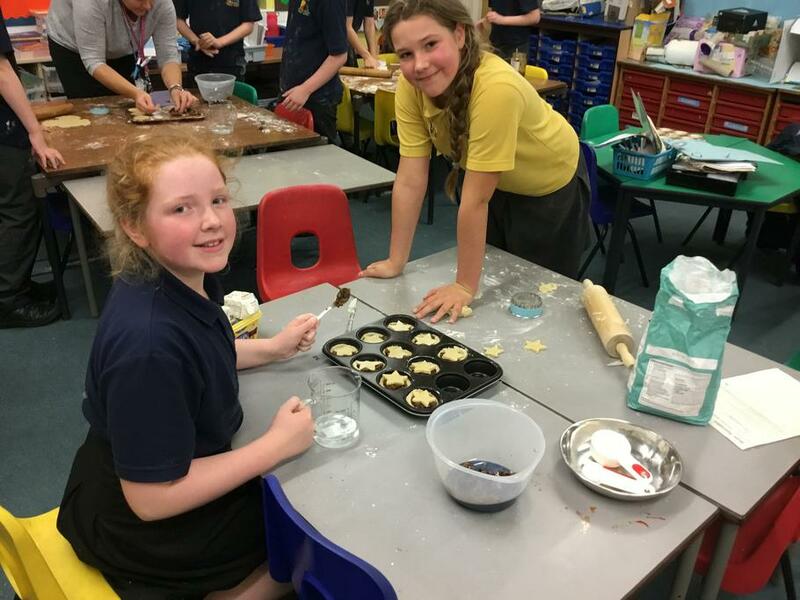 Bishop Monkton decorate off. 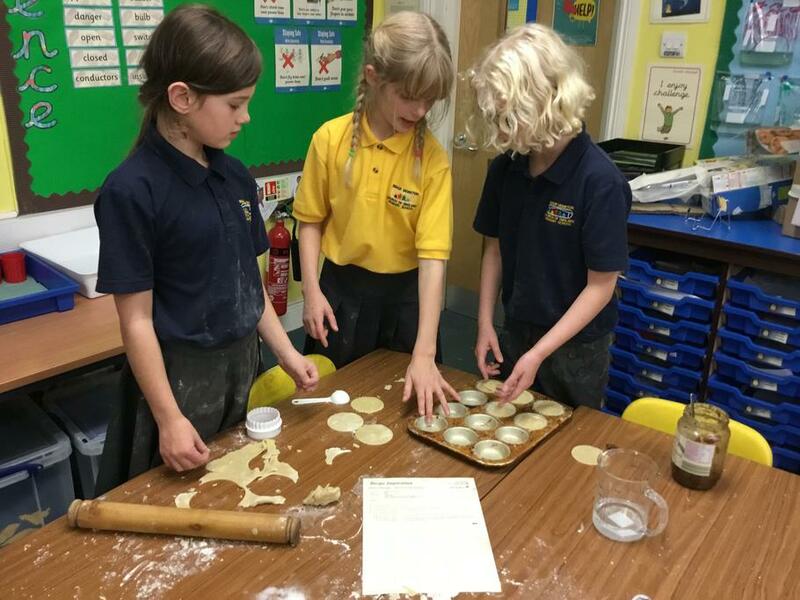 With this being the last session for the Y5/6 children, we decided to challenge the children to decorate four buns in the theme of Valentine’s Day. 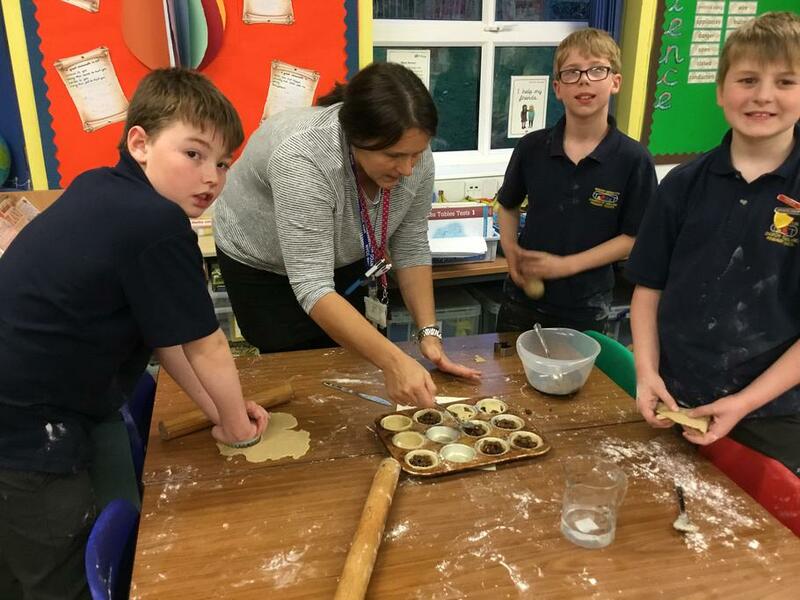 Mrs Filippi was head judge and spent a long time deliberating who the overall winner was going to be. 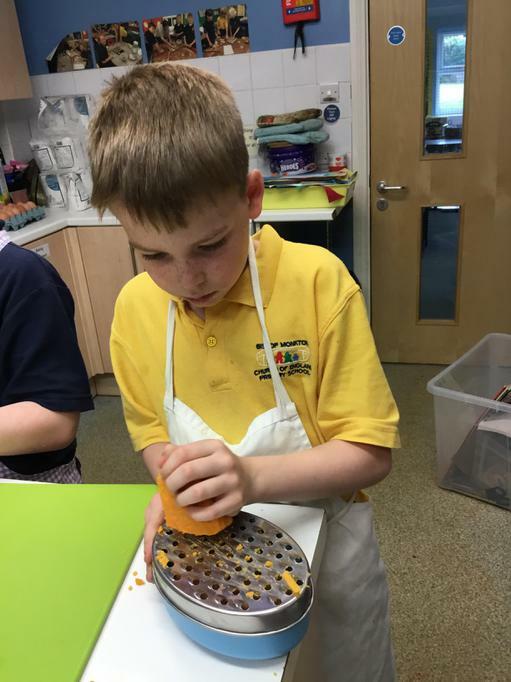 After some time, Mrs Filippi picked Oliver Cairns , well done Oliver. 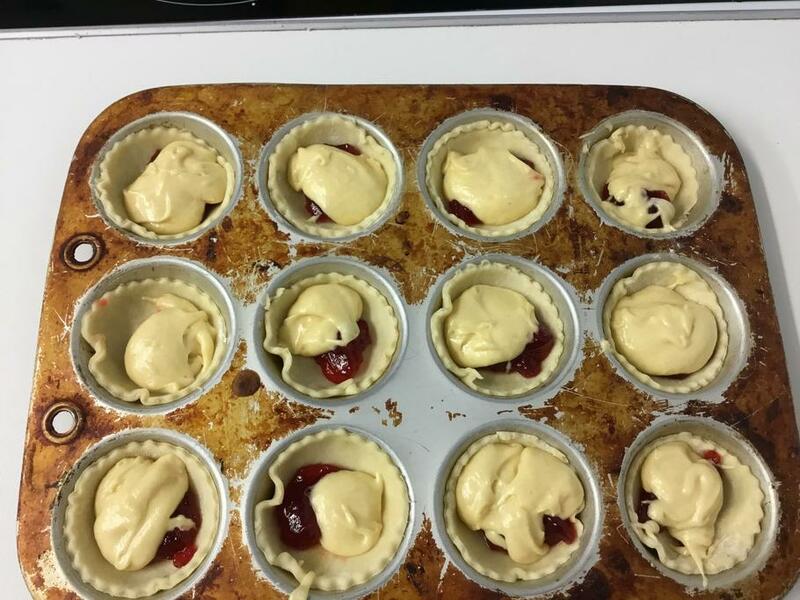 Don’t they all look fabulous. 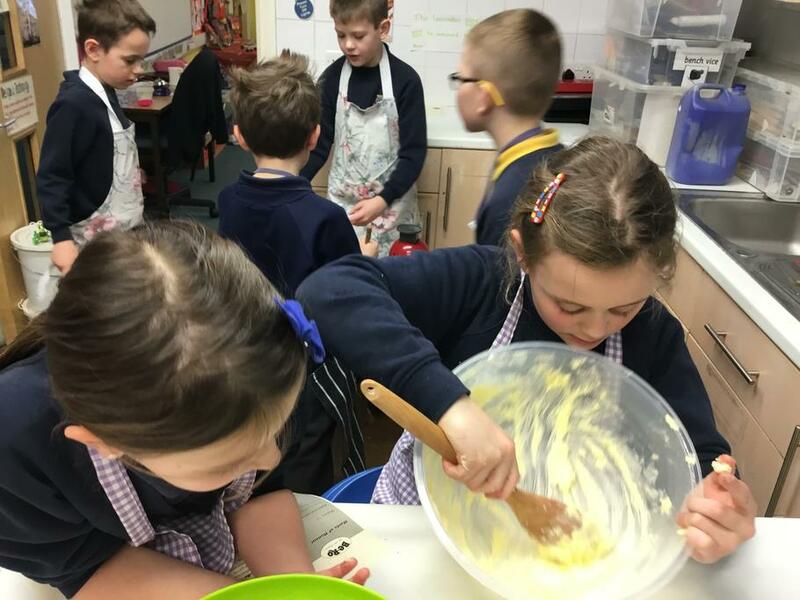 Mrs Verrill and Mrs Coupland wearing our new aprons made by Mrs Brown, with the cookery club. 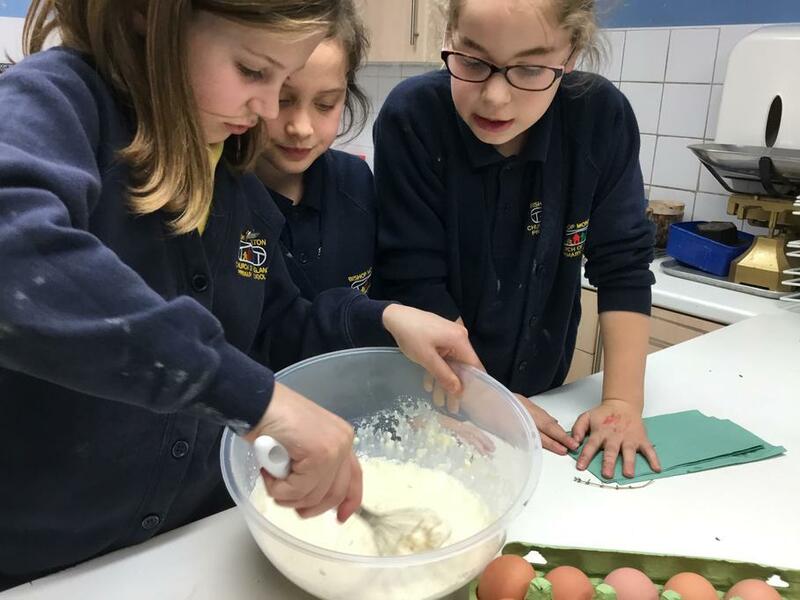 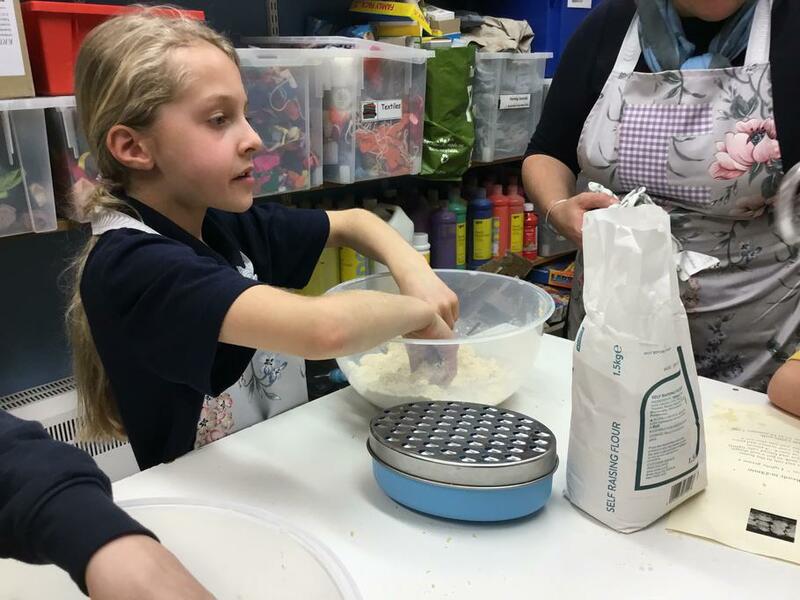 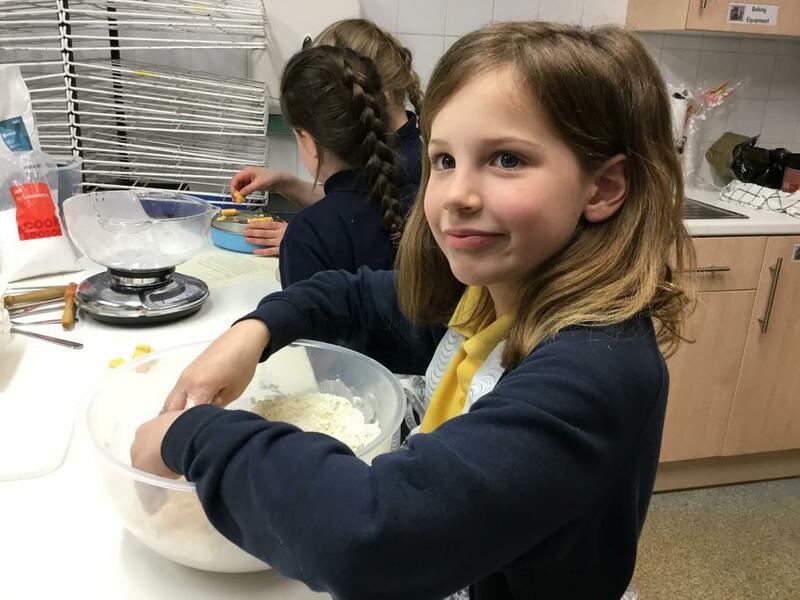 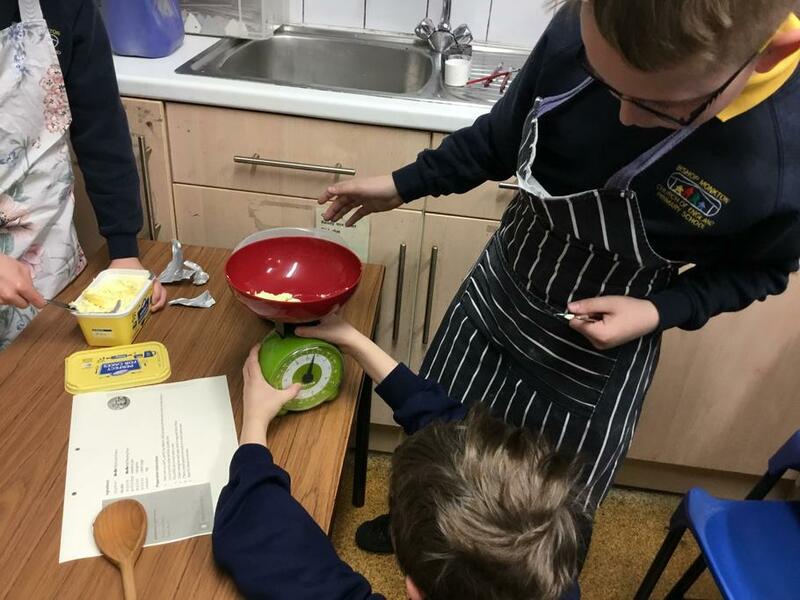 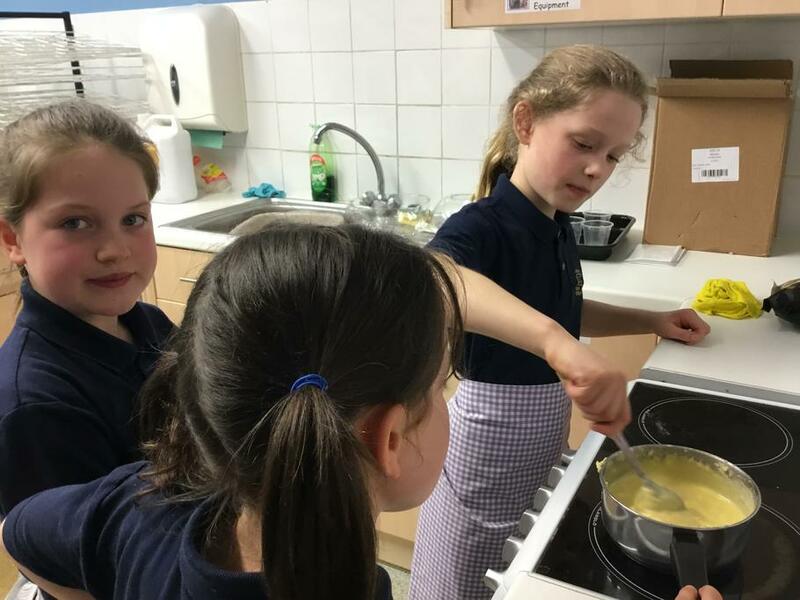 This week in cookery club (30/1/2018) we have made mini vegetable frittatas. 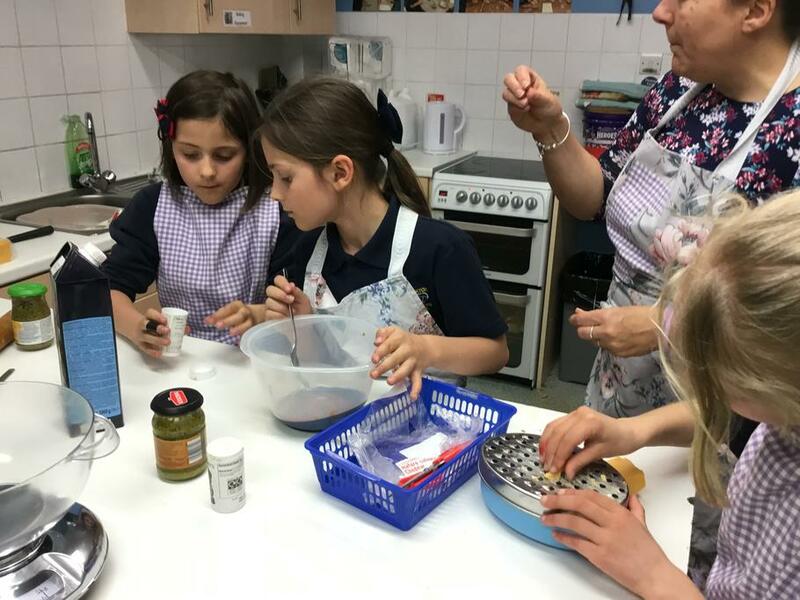 Making chocolate truffles and fudge this week.